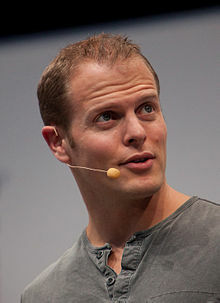 Timothy Ferriss (born July 20, 1977) is an American author, entrepreneur, and public speaker, best known for his 2007 book The 4-Hour Workweek: Escape 9-5, Live Anywhere, and Join the New Rich, which was a New York Times and USA Today bestseller. Money is multiplied in practical value depending on the number of W's you control in your life: what you do, when you do it, where you do it, and with whom you do it. Alternating periods of activity and rest is necessary to survive, let alone thrive. Capacity, interest, and mental endurance all wax and wane. Plan accordingly. Doing less meaningless work, so that you can focus on things of greater personal importance, is NOT laziness. This is hard for most people to accept, because our culture [American] tends to reward personal sacrifice instead of personal productivity. If the potential damage is moderate or in any way reversible, don't give people the chance to say no. Most people are fast to stop you before you get started but hesitant to get in the way if you're moving. Get good at being a troublemaker and saying sorry when you really screw up. In excess, most endeavors and possessions take on the characteristics of their opposite. "If only I had more money" is the easiest way to postpone the intense self-examination and decision-making necessary to create a life of enjoyment - now and not later. People who avoid all criticism fail. It's destructive criticism we need to avoid, not criticism in all forms. I've trained myself to propose solutions instead of ask for them, to elicit responses instead of react, and to be assertive without burning bridges. To have an uncommon lifestyle, you need to develop the uncommon habit of making decisions, both for yourself and for others. Being busy is most often used as a guise for avoiding the few critically important but uncomfortable actions. Being busy is a form of laziness - lazy thinking and indiscriminate action. Being overwhelmed is often as unproductive as doing nothing, and is far more unpleasant. Being selective - doing less - is the path of the productive. Focus on the important few and ignore the rest. Just as modern man consumes both too many calories and calories of no nutritional value, information workers eat data both in excess and from the wrong sources. It's amazing how someone's IQ seems to double as soon as you give them responsibility and indicate that you trust them. Creating demand is hard. Filling demand is easier. Don't create a product, then seek someone to sell it to. Find a market - define your customers - then find or develop a product for them. There are tons of things in your home and life that you don't use, need, or even particularly want. They just came into your life as impulsive flotsam and jetsam and never found a good exit. Whether you're aware of it or not, this clutter creates indecision and distractions, consuming attention and making unfettered happiness a real chore. It is impossible to realize how distracting all the crap is - whether porcelain dolls, sports cars, or ragged T-shirts - until you get rid of it. Mr. Ferriss makes little pretense of practicing what he preaches, at least if you count self-promotion as "work."